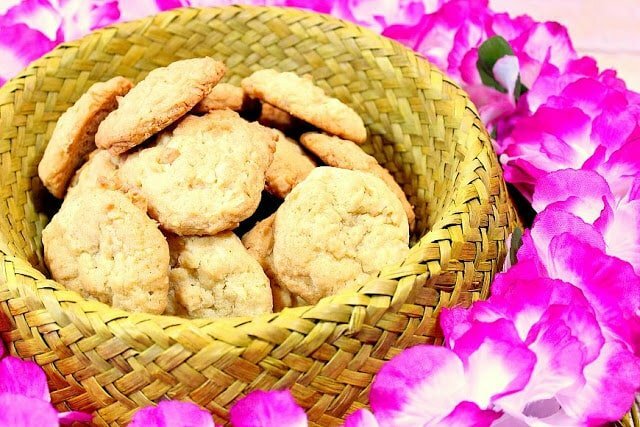 Coconut Macadamia Nut Cookies are just what you’re craving when you need a little something sweet, and a little something rich and buttery. I’ve never been to Hawaii, and it’s on my bucket list of places I’d like to visit one day. Until that time, the closest I’ll get is that my husband and I are throwing a big luau party/pig roast party in our backyard in the next couple of weeks. These cookies will be on the dessert menu. We’ve been planning this party for the past few months and are going all out with the decorations, food, beverages, and guest list. If I’m honest here, it probably would be cheaper for us to actually travel to Hawaii than throw this party. LOL. Here is a copy of the invitation I sent out to family and friends. I think it sets the tone for the party with its colorful theme and whimsical feeling. If you happen to be in the area, why don’t you join us. You’re always welcome here! We’re not roasting the pig by ourselves. We have not idea how to do that, and don’t feel like digging a big pit in our lawn for that purpose. We’re hiring a local company to do that for us (not the big pit part), and they’ll be here to professionally carve it when it’s dinnertime. Our catered dinner will consist of pulled pork sandwiches (with buns, tortillas and cornbread), roasted red potatoes with butter and parsley (not exactly Hawaiian fare, but something that will please the masses), baked beans, and tropical coleslaw. Since I’m not cooking the dinner portion of the party, I’ve decided that I’ll take care of all the appetizers and desserts instead. To keep things under control and organized (as best I can) I’ve started baking the cookies in advance of the party and am storing them in the freezer. The cupcakes will happen next week. 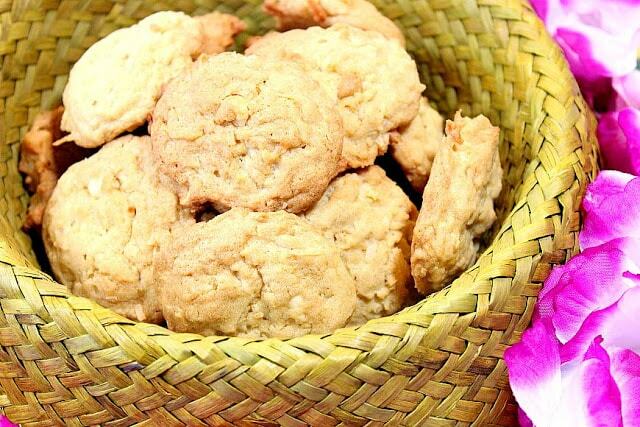 First up is this recipe the Coconut Macadamia Nut Cookies. It was hard not to sample them after they’d come out of the oven because they smelled incredible. However, I was good and waited for them to cool completely before I took some photos, then bagged them carefully and stuck them in the freezer. -In a large bowl with a hand mixer, or a stand mixer using the paddle attachment, beat together the butter and sugars. Blend in the vanilla, coconut extract and eggs. -In a medium size bowl, whisk together the flour, salt and baking soda. Gradually blend the flour into the butter and sugar mixture until dough is thick and heavy. Blend in the coconut and macadamia nuts until fully incorporated. -Drop tablespoon size dough onto parchment lined baking sheets leaving about 2 inches between each cookie. Bake two cookie sheets at a time in a preheated oven for approximately 20 minutes, rotating the cookies sheets half way between baking. -Remove to a baking rack to cool completely and enjoy! 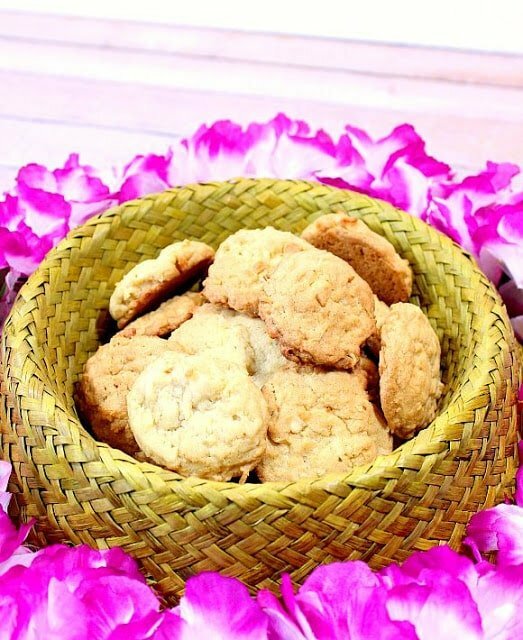 I hope you’ll stay tuned to my blog because as we get closer to our luau party date, I’ll be sharing the additional cookie, cupcake and appetizer recipes with you that I know you’ll enjoy. 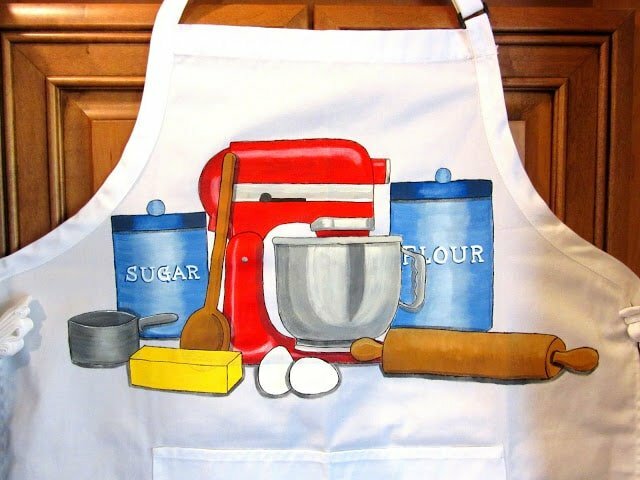 In the coming weeks, I’ll be getting a lot of use out of my apron, and my mixer. So it seems only fitting that I share my hand painted apron design with you. It’s one of my absolute favorites! If there is ever anything I can paint for you, from aprons to tea towels, to glassware items, please don’t hesitate to contact me or visit my shop on Etsy. Custom orders are always welcomed and are always encouraged. What can I paint for you? Kudos Kitchen by Reneé ~ Where food, art, and fun collide on a regular basis! I’m thrilled to be linking up this post and recipe to Carole’s Chatter: Vintage Coconut. These cookies look great and so yummy! That sounds like a fabulous party – wish I was going 😉 Also, I really want to go back to Hawaii…with a big bag of these cookies for the plane ride! These sound fabulous and perfect for the party. Wish I was going! I too have never been to Hawaii…sigh… but can I have a to go bag of these cookies? Please?! Coconut and macadamia sound like the perfect match! Sounds like a really fun party! Great menu and even nicer that you don't have to cook it all yourself, right? These cookies will be the perfectly appropriate dessert. Now that sounds like a party I'd love to be at! Hawaii is definitely on my "some day" list, too. These cookies will be the perfect sweet treat! I would love to visit Hawaii someday too. 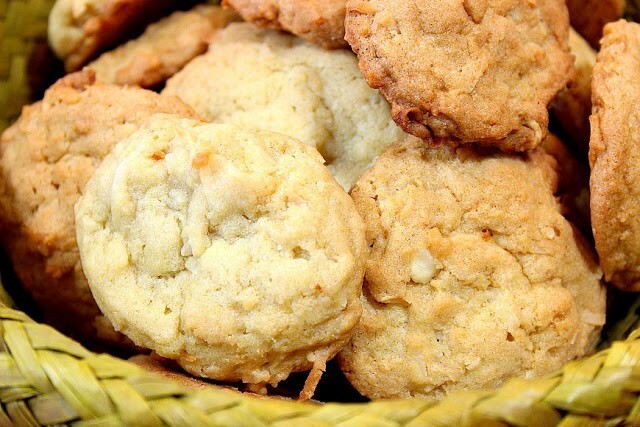 These cookies look so perfect — LOVE macadamia nuts! That apron is one of my favorites too! Thanks for getting em in the party and Hawaiin mood with these delicious sounding cookies. What a fun party (a pig roast!?!) and these cookies sound like the perfect dessert! Love macadamia nuts! These cookies look amazing! I know I'd love them because I love coconut! Sweet, Rich and Buttery? I'm in! Sweet, Rich, and Buttery. Heck yeah! Pass the plate please. Hi Renee, I would love you to stop by Food on Friday: Coconut over at Carole's Chatter to add this to the recipe collection! Cheers! 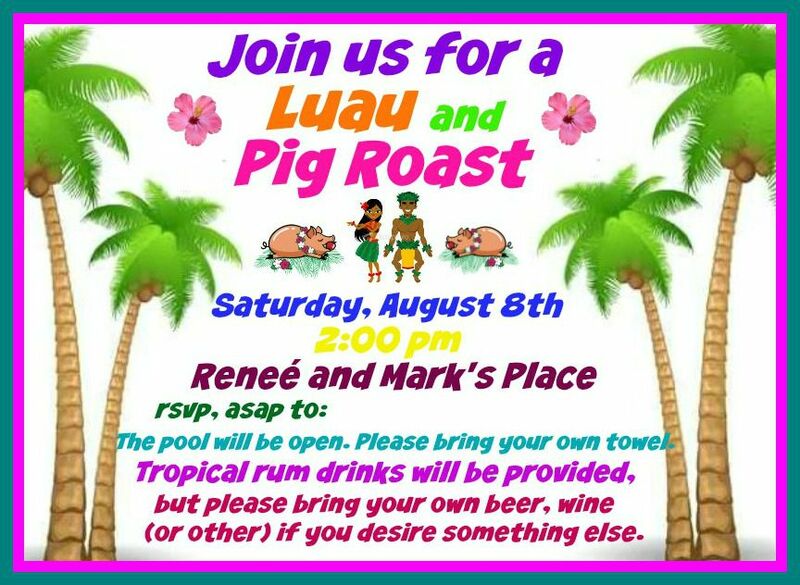 How fun that you are throwing a luau! 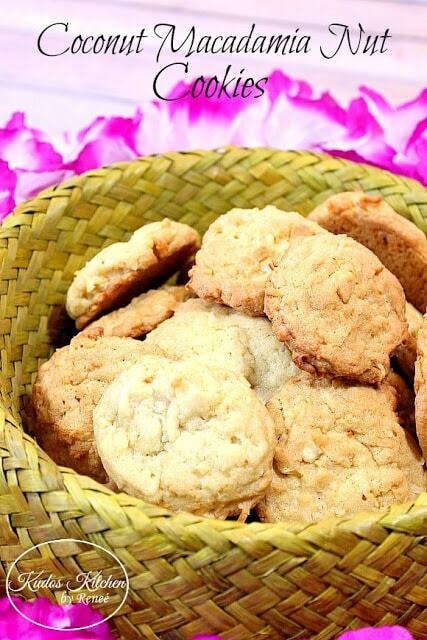 There's nothing better to get you in the Hawaiian mood than coconut with macadamia nuts. These cookies look like the perfect choice for your party! Love the apron! You are so talented! And the cookies…YES! thanks Renee – and that apron is so fab! Cheers from Carole's Chatter!